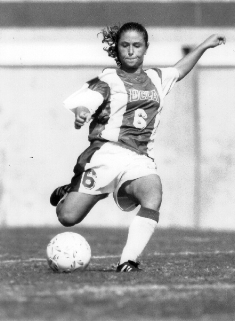 Louise Lieberman was Beverly Hills High’s mid-fielder 1990-1991 and Girls Varsity ‘Rookie of the Year’ and ‘’MVP’, All-League, and won All-CIF honors. Ten years later, in 2001 (through 2003), she was Beverly’s Varsity head coach of girls’ soccer. In between, Lieberman was UCLA’s midfielder 1995-98, making second team All- PAC 10 in 1995, and voted to Soccer America’s Top 11 Recruits list. She played one match with the U.S. Women’s National team. In 1997-98, Louise was named the Bruins “Most Inspirational” player. The Bruins never failed to make the NCAA playoffs during her college career. In 2001, Lieberman played the WUSA’s inaugural season with the Washington Freedom. She also played semi-pro with several teams, including the WPSL’s L.A. Rampage in 2008, where she is women’s Director of Coaching.